We See Heaven Upside Down is group exhibition with seven visual artists and one film maker of regional, national and international recognition. Additionally, several international composers and musicians have contributed new original music for a live performance-turned-music installation. In and through visual and performing arts, the exhibition seeks to spur and inspire moments of genuine empathy towards other individuals and their journeys. At the heart of this multi-disciplinary exhibition are compelling stories of migration, displacement, identity and home, expressed through visual and performing arts. We See Heaven Upside Down is presented by the gallery in partnership with Moving Poets. Heaven in A flat – A Musical Response | 6:30-8:00pm Live concert and performance begins promptly at 7pm. Luger, a Santa Fe-based Native American multi-disciplinary artist, and winner of the inaugural Burke Prize for contemporary craft by the Museum of Arts and Design, was raised on the Standing Rock Sioux Reservation in North Dakota. Luger uses social collaboration to address contemporary issues and focuses much of his work on environmental matters and issues of violence against indigenous populations. Documentary screening of film short “Exile,” by Syrian film maker Dellair Youssef and moderated panel discussion with Marsha Hirsch (Executive Director, Carolina Refugee Resettlement Agency), Rusty Reynolds (Executive Director, International House), former Bhutanese refugee Thakur Mishra and multi-disciplinary artist MyLoan Dinh. Nico Amortegui was born and raised in Bogotá, Colombia, and has worked in the United States since the 1990s. His current artistic foci include large-scale paintings on canvas or wood panels, and sculpting and wood-working with found objects. As an immigrant, he became acutely aware of the challenges faced by those aspiring to achieve the “American Dream”. Throughout his practice, he provides snapshots of lifestyles repeatedly tasked with transitions—his own and of those he encountered along the way. He creates portraits of those who defied the odds. Amortegui’s joyful yet jarring work, often filled with unapologetic color, is an immediate product of his expressed energies—that is to say: there are no sketches or previous drawings. Working solely in the present moment, urgency, rawness and pace transfer to the canvas. His latest public commission can be seen at Charlotte Douglas International Airport. His work has been shown throughout the the United States, notably at the Smithsonian Anacostia Museum (Washington DC), Levine Museum of the New South, McColl Center for Arts and Innovation, Mint Museum, Duke Energy Children’s Museum (Cincinnati), and Art Basel (Espitia Gallery, Miami). He now resides in Charlotte with his wife and two daughters. For decades, the Swiss artist Luis Coray has made a name for himself as a visual artist and performer. His paintings register an interplay of light and shadow, and dialogues between past and present, loss and recovery. Coray’s sensitive visual language often reflects his unique cultural identity: Romansh, an ethnic minority from the remote Swiss Alpine regions who speak an ancient endangered language. He studied art history at the University of Zurich and visual design at the Zurich University of the Arts. Additionally, Coray has trained with contemporary luminaries: conceptual artist Not Vital at the Academy of the Art School Liechtenstein and performance artist Tino Sehgal at the Beyeler-Museum, Riehen. His work has been exhibited in Switzerland and Germany and can be found in private and public collections including Graubündner Cantonal Bank, City of Chur (Switzerland), Canton Graubünden, the Lia Rumantscha Institute and RTR Radiotelevisiun Svizra Rumantscha, Cuira. His awards include the 2015 Arts Award from Canton of Grisons, Berlin Department of Culture Studio residency and the 2008 Cultural Contribution prize in Grisons. He lives in Chur with his wife and three daughters. MyLoan Dinh was born in Saigon, Vietnam. On April 30, 1975, during the Fall of Saigon, she and her family fled by sea, eventually resettling in Charlotte, NC. Majoring in visual arts, Dinh studied at the University of North Carolina at Chapel Hill and the School of Arts and Design at Wollongong University New South Wales, Australia. She is the founder of the international multidisciplinary arts project, We See Heaven Upside Down. Her mixed-media work explores the porous boundary between personal and collective history. Reflecting on her experiences as an immigrant and woman of color, her work often addresses everyday manifestations of cultural identity, memory and displacement. She has exhibited internationally, and her work can be found in private collections in the United States, Germany and Switzerland. Her awards include: Arts & Science Council Regional Artist Project Grant (Charlotte, NC), Berlin Department of Arts and Culture Artist Grant (Treptow-Köpenick), and the Partnership for Democracy Project Grant (Berlin) and Arts & Science Council 2018 Cultural Vision Grant (in collaboration with Moving Poets). Dinh is a member of the Asian American Women Artists Association (AAWAA) and the BKK, Professional Association of Visual Artists Berlin. She and her husband, Till Schmidt-Rimpler, founder and artistic director of Moving Poets, have creative projects in the USA and Germany. Michelle “Bunny” Gregory was born and raised in Charlotte, NC. She graduated with a degree in fashion illustration from the Art Institute of Fort Lauderdale, Florida. After her degree, she was the head of design for the special events firm, Creatrix. Since 2000, she has collaborated with Moving Poets as a costume designer. In 2010, she was invited for a three-week artist residency in Berlin, Germany. Growing up in the 70s and 80s, Bunny realized there weren’t any known venues for Black artists to express themselves in Charlotte. Because of her love for hip hop and pop art, she opened her own venue, the UNDERGROUND, in 2014, which quickly became a staple platform for Charlotte-based urban artists, musicians and poets. In 2017, Bunny was dubbed “Queen Mother of Charlotte’s Underground Hip Hop” by Creative Loafing Magazine. She is currently working on creating a “Harlem Renaissance” on wheels: the UNDERGROUND Mobile Art Studio & Gallery for young black artists, serving low income youth in West Charlotte where she grew up. Her mixed-media studio work is heavily influenced by Afrocentric culture addressing issues of racial and economic disparity, and often utilizes illustration, comic book-style drawings, pen & ink and collage on salvaged boards. Cannupa Hanska Luger is a New Mexico-based, multi-disciplinary artist. Raised on the Standing Rock Reservation in North Dakota, he is of Mandan, Hidatsa, Arikara, Lakota, Austrian, and Norwegian descent. Through social collaboration and by responding to timely and site-specific issues, Luger produces multi-pronged projects of many forms. Through monumental installations that incorporate ceramics, video, sound, fiber, steel, and cut-paper, Luger interweaves performance and political action to communicate stories about 21st-century Indigeneity. Luger is the recipient of the NYC Museum of Arts and Design’s 2018 Burke Prize, an inaugural award celebrating ‘highly accomplished work, strong use of materials, innovative processes, and conceptual rigor and relevance’. Luger has exhibited internationally, including the Princeton University Art Museum, Washington Project for the Arts, Art Mûr (Montreal), Crystal Bridges Museum of American Art (AR), Orenda Gallery (Paris), Autry Museum of the American West, and the National Center for Civil and Human Rights (Atlanta). He lectures and participates in residencies around the globe and his work is collected internationally. Luger holds a BFA in studio arts from the Institute of American Indian Arts. Susanne Roewer was born in Bad Schlema, Germany, and graduated with a master’s degree in sculpture at the Universität der Künste, Berlin. Via extensive research, her work critically references historical figures and events, folk art and fables, as well as current socio-political debates. Her sculptures are rooted in her explorations of elementary materials, such as metal, stone or glass, combining figurative and abstract elements. Roewer’s works display conceptual wit alongside an artistic sensibility for materiality. She was the co-founder of the G7 Berlin Network Gallery, together with fellow artists Gregor Hildebrand and Roger Wardin, before moving to Switzerland to collaborate with various collectors and sponsorship programs. Her works have been exhibited internationally, notably the Fort Wayne Museum of Art (Indiana, together with Georges Beasley), the Fondacion Abanico (Geneva), at Il Giardino di Daniel Spoerri (Italy), Momentum Hot Glass (Toledo/Ohio), Art Basel (Switzerland and Miami), Farhang Foundation at the Craft and Folk Museum (Los Angeles) and a solo exhibition at the Kunstverein Kreis Gütersloh. Roewer lives and works in Berlin, Germany. Parallel to the exhibition at Elder Gallery of Contemporary Art, Susanne Roewer will be presented by Galerie Kornfeld in Berlin. The opening is part of the international Gallery Weekend Berlin 2019. Rosalia Torres-Weiner is an artist, activist and community leader. 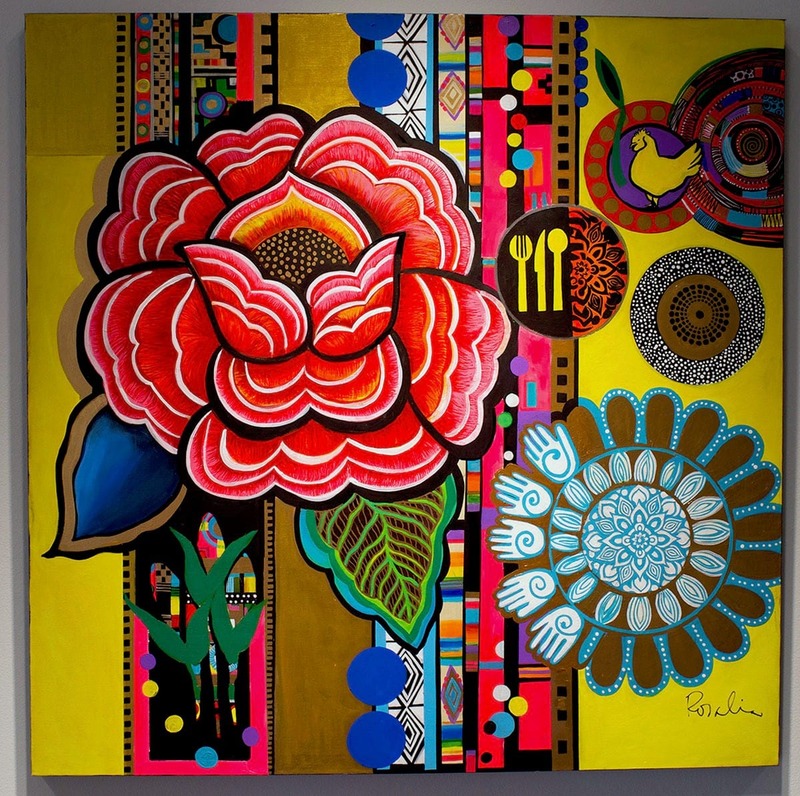 Her work is featured in the permanent collection of the Smithsonian Anacostia Museum and has been exhibited in venues including the McColl Center for Arts and Innovation, Levine Museum of the New South, UNCC’s Projective Eye Gallery, the City of Raleigh Museum, the Birmingham Civil Rights Institute, and the Mexican Cultural Institute in Washington D.C. Her public murals celebrate the rich history of her native Mexico and the changing demographics of the US-American South. She uses her art to document social conditions and raise awareness about issues affecting immigrant communities, including family separation, racism and overcoming stereotypes. Her work was recently featured in a solo exhibition at Georgia College’s Leland Gallery in October 2018. She has been a guest speaker for the North Carolina ASC, Johnson & Wales University, George Washington University, the National Association of Latino Arts and Culture, and the Southern Foodways Alliance. Through her Red Calaca Mobile Art Studio, a 24-foot “Art Truck”, she takes the arts directly to people in under-served immigrant communities in Charlotte. Dellair Youssef is a director and writer born in Damascus, Syria, from which he fled in 2011. He has directed several films, including ‘The Princes of the Bees’, ‘Exile’, ‘Banyas: The Beginnings’, and ‘Clothesline’, which have been screened at multiple international film festivals. Youssef is also the author of ‘Tales of this Time’ (2014), which shares his life, travels and reflections on the Syrian revolution. His articles and essays are regularly featured in Arabic blogs and newspapers, as well as in a selection of German newspapers and magazines. Youssef studied Ecology at Damascus University and film studies in Syria and the Netherlands. Alongside his professional work, he has volunteered with NGOs in Syria and Lebanon since 2007. He is now based in Berlin, Germany. A native of Minneapolis, MN, Todd Clouser is a prolific composer, guitarist, songwriter and performer based in Mexico City. Combining elements of rock, jazz blues, spoken word and improvised music, Clouser has performed at music festivals across the globe, alongside luminaries including John Lurie, John Zorn, Flea, Cyro Baptista, John Medeski, and Keb Mo. Clouser’s music trio, A Love Electric, explores his songwriting while honoring the jazz tradition’s inquisitiveness and fearlessness, together with Latin Grammy award winner, Hernan Hecht, on drums and Aaron Cruz on bass. Mexico City’s La Jornada named them “one of the most important acts of recent years”. The trio has released 6 records on labels in the US and Mexico while performing nearly 1,000 concerts over the span of 7 years. Philanthropy and community outreach have been important facets of Clouser’s work in Mexico and beyond. With the founding of his “Music Mission” initiative, he and patrons have donated thousands of dollars worth of instruments, educational materials, workshops and basic needs to support communities in Nicaragua, Chiapas, Oaxaca, Mexico City and Durango. He is also the founder of Ropeadope Sur, a record label based in Mexico City which focuses on showcasing under-recognized Mexican musicians. The first act they signed, for instance, was Los Cardencheros de Sapioriz, an acapella group singing slave-era songs on the ranches of northern Mexico. Milad Khawam is a trumpeter, duduk player and composer from Damascus, Syria. Escaping the Syrian war in 2015, he immigrated to Berlin, Germany. Khawam studied Classical and Arabic music in Damascus. Since 2010, he played principal trumpet with many orchestras in Europe and the Middle East, including the Berlin Philharmonic. He performed with different fusion groups at festivals across Germany, such us Morgenland-Festival 2016, Karneval der Kulturen 2016 and Xjazz-Fest Berlin 2018. He also loves to produce electronic music. Khawam’s compositions have been played by numerous bands in various festivals and his original soundtrack for the short film, “No Monsters in Berlin”, won the Grand Jury Prize at the Cannes Film Festival 2017. Next to composing music for We See Heaven Upside Down with Todd Clouser, Milad is currently working on his new album, “To the West”. Till Schmidt Rimpler is a choreographer, director, and musician born in Dortmund, Germany. Schmidt-Rimpler studied at the University of Music and Performing Arts Munich and Codarts University of the Arts Rotterdam. He was a member of the Dutch National Ballet and a principal artist with North Carolina Dance Theatre. He has choreographed for Michigan Opera Theatre, Opera Carolina and Children’s Theatre Charlotte. He was a lecturer at the University of North Carolina at Charlotte and a professor at the Universidad Miguel Hernandez in Altea, Spain. In 1996, Schmidt-Rimpler founded Moving Poets in Charlotte (together with actor/director Randell Haynes and poet/writer Chuck Sullivan). In 2011, he and his wife, visual artist MyLoan Dinh, opened Moving Poets Berlin. In 2014, they founded NOVILLA, an international center for arts, creativity and exchange. Spearheaded by Schmidt-Rimpler, Moving Poets has created, produced and/or curated a wide variety of artistic projects across the USA and Germany, including: stage productions, creative workshops, festivals, youth programs, and music concerts. One of Schmidt-Rimpler’s central goals is to bring together artists from diverse fields, cultures and age groups by building communities and facilitating cross-cultural exchanges. Moving Poets is an international professional nonprofit arts organization founded in Charlotte in 1996. The organization strives to convey content and stories that are meaningful for artists and audiences alike, support the presentation and creation of high-quality contemporary art, and serve as an incubator for forward-thinking works. We See Heaven Upside Down is supported in part by the 2018 Arts and Science Council Cultural Visions Grant. For more information, please visit www.movingpoets.org.